A new study, published today in Nature Ecology and Evolution, reveals that bird’s skulls evolved differently to their relatives and ancestors, and develop more like those of young dinosaurs and crocodiles. Previously, Dr Arkhat Abzhanov, from the Department of Life Sciences at Imperial, and colleagues determined that the shape of the birds’ skulls most resemble those of young non-avian (non-birdlike) dinosaurs. This evolutionary phenomenon is known as ‘paedomorphism’ – where an adult retains features that are usually only seen at the young stages (embryo or baby) in its ancestors. Paedomorphism is caused by a change in timing of developmental events of an organism – for example growing certain body parts at later stages, slower, or not at all. It is known to play an important role in the evolution of some new species, as the ‘young’ creatures can adopt a different lifestyle compared to their more ‘mature’-looking relatives, avoiding competition for the same resources. To better understand the origins of birds’ unique skulls during their evolution from more primitive reptiles, Dr Abzhanov and colleagues from Yale University have now analysed the relationship between brain and skull. Dr Abzhanov said: “The skulls and brains of birds are dramatically different from those of adult non-avian dinosaurs and other reptiles, and we can show that these differences reflect how birds evolved to become species of forever-young dinosaurs. The development of the skull is a particularly complex process, where hard bony tissues have to interact with many other organs, such as the eyes and brain. 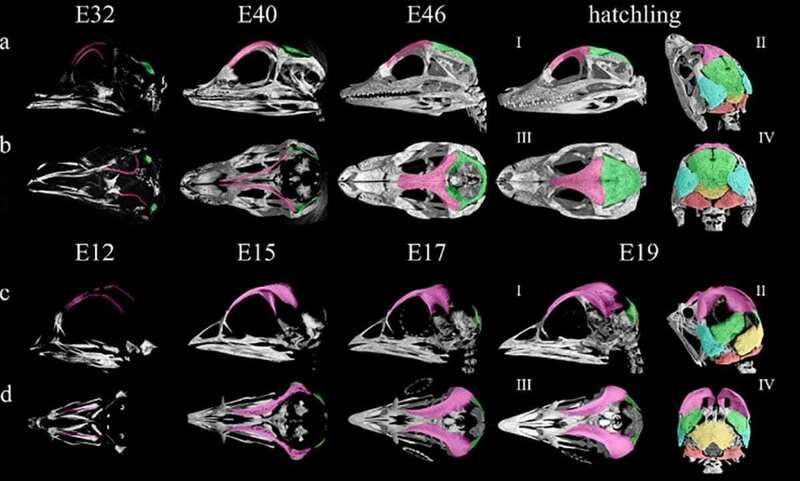 Birds’ skulls appear to remain proportionally much larger and rounder than those of other reptiles through development, retaining their embryonic characteristics. Dr Abzhanov said: “Evolution is the accumulation of and selection on changes made to the developmental process. Studying birds is a fascinating subject because they retain features of ‘young’ dinosaur ancestors, while also clearly adding their own adaptations, such as toothless beaks and wings. The team’s 3D modelling of skulls represented some of the best (and in some cases first) characterisations for many of the species in the study. Skull bones are often used to identify animal species, to classify them into groups, and to determine courses of their evolution, by tracking the changes in certain bones across species.